Set amidst lush mangroves, Spa Village Gaya Island is a tranquil hideaway surrounded by distinctive island flora and fauna. From the warm clear waters of Gaya and its rich lowland forests to the high altitude blossoms of Mount Kinabalu, our treatments utilise only the finest fresh local ingredients. A rich tapestry of spa programmes reflects the cultural healing traditions of Sabah's many indigenous people. From the specialised rice scrubs and masques of the Kadazandusun to the age-old practices of the Bajau sea nomads, Spa Village Gaya Island is uniquely rooted in ancient tradition while seeking to restore balance to the body and soul. Rice plays an important, mythical role in Kadazandusun culture. Every year thanksgiving is offered to the revered rice spirit Bambaazon during the Tadau Kaamatan or Harvest Festival. Our couples' experience pays tribute to these legends and the honoured element of rice. Explore the intangible yet powerful realm of scent. Be guided by our scent artist through the indigenous oils of Borneo. Learn the basics, their potent benefits and the art of custom blending. Inspired by Mount Kinabalu’s vast biodiversity, begin with a foot treatment that includes a salt scrub, a warm herbal bath, and a cool orchid soak. 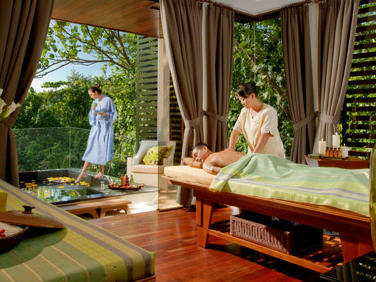 Then receive a body steaming with a warm herbal ginger blend and conclude with a deep tissue massage.